But does the rebuttal get the fanfare of trumpets that greets the warmy paper? Not likely. The media ignore it, so nobody knows about it and the climate gravy train rattles happily on. But now a central warmy myth is destroyed — and a more important rebuttal of the preposterous human climate ruination theory would be hard to imagine. For the new analysis contradicts fundamental forecasts of “extreme weather events … such as drought, flooding, cold spells, and heat waves” that underpin the climate scare. These are not new things, of course. Extreme weather events have been happening for millenia, but they represent most of the bad things we fear from global warming. They would endanger lives and infrastructure and gravely reduce food production, hinder transport and travel, and raise anxiety everywhere. Elimination of these potential perils is greatly to be desired. Now the threat of those perils has been removed, humanity has true cause to celebrate—except that most people won’t be told about it. On 17 March 2012 Geophysical Research Letters published “Evidence linking Arctic amplification to extreme weather in mid-latitudes“, by Jennifer A. Francis and Stephen J. Vavrus. That paper was updated on 6 January 2015 by Evidence for a wavier jet stream in response to rapid Arctic warming published in Environmental Research Letters. Four days ago Dr Ed Berry published A Warming Arctic Would Not Cause Increased Severe Weather or Temperature Extremes (Berry 2016), a critique by Chuck Wiese (Wiese 2016), in which he contradicts the claims made in Francis and Vavrus 2012. [Evidence linking Arctic amplification to extreme weather in mid-latitudes, by Jennifer A. Francis and Stephen J. Vavrus (2012)] FV (2012) is fatally flawed, incorrect and should be withdrawn by the authors. As shown here, there is no theoretical basis in which to ground FV (2012). Using the proper Rossby wave physics as illustrated here, these atmospheric waves (or commonly called planetary atmospheric waves that generate low and high pressure systems that create our weather, severe and otherwise) behave in the opposite fashion as claimed in FV (2012). A warming Arctic that is supposed to be weakening the westerly wind belt across the northern hemisphere would create an entirely different effect on the earth’s weather [than] FV (2012) claims. If FV (2012) claims were true, the physics governing these waves would require them to flatten in amplitude and migrate to a higher latitude, causing a much weakened effect on the Northern Hemisphere’s weather patterns. If FV 2012 claims were true, precipitation systems would weaken and migrate northward with the migrating jet stream. Storms, severe and otherwise would become far less common than today and would be replaced with problematic drought and much higher surface absolute and relative humidities. This increased low level moisture would lead to sporadic showers and thunderstorms in an ever expanding maritime tropical airmass environment, but not enough precipitation to forestall severe droughts. Sounds like this has been in the textbooks for decades. Why only now does a scientist explain the physics to us, or why has it taken we amateurs so long to notice it? This is deadly to the panic stirred up by the warmies, like so much else that has been surfacing lately. In comments on Berry 2016Wiese 2016, one Erl Happ appears to speak knowledgeably and says that the authors of these papers appear to have a weak grasp of reality. “Neither is in a position to describe cause and effect.” Which is a stiff-armed challenge indeed. It’s a big job, but would it be too much to hope an objective meteorologist or atmospheric scientist might scan the arguments and equations in both Francis and Vavrus 2012 and Berry 2016Wiese 2016, and express an opinion on their worth? What do you think? When in doubt, side with the referred paper in a scientific journal rather than a blog post. There is a lot of pseudo-science rubbish posted in blogs by people who don’t know what they are talking about. Quite a few meteorologist have observed though that the northern hemisphere jet stream has become ‘wavier’ in recent years and has got ‘stuck’ for long periods leading to hot, cold, drought and rainfall extremes. Determining cause from effect is difficult though as is inferring whether this is a permanent or temporary feature. Yes. Or, as I did, ask for an objective meteorologist or atmospheric scientist to scan the arguments and equations and express an opinion on their worth. The question is whether that’s a natural fluctuation. Some say it is caused by our naughty CO2 emissions raising the temperature, but since the temperature has hardly gone up for 20 years it can’t be that. If the jet stream gets wobbly with a small temperature increase it must fluctuate all the time. Impossible to imagine that global temperature has any influence on jet stream meanderings; regional atmospheric temperature might, but it would be more likely that high and low pressure systems push the jet stream around more than temperature does. The paper is by Chuck Wiese, Meteorologist, Weatherwise, Inc. Not Ed Berry as RT states. You don’t say so explicitly but you do imply that Chuck Wiese has not applied the physics principles correctly i.e. he does not know what he is talking about. A) What evidence do you have for this or are you just throwing mud (or do I infer incorrectly? B) Have you even looked at the physics yourself (see the physics application below but I’m wondering what you are basing your opinion on – argument from authority? what?)? Michael Sweet, MA Rodger and Philippe: I will answer your comments in this one post. To repeat, Jennifer Francis’s conclusion in her paper and this article are wrong. You are trying to claim that just because she wrote it and it is more recent than the published and peer reviewed literature along with other recent publications, that time erases in and of itself older work. That is not how science works and any scientist with a doctorate degree knows this, and this is precisely what I have seen in many instances of work done in climate papers as they relate to atmospheric science. Assumptions are made and sometimes without bothering to look at the founding principles to see if they agree. I provided the references of this literature to show they do not and the specific equation that is used to estime a maximun Rossby wave amplitude. And as it solved from the primary equations, it is obvious that wind speed and latitude determine that amplitude with speed controlling. (And Philippe, yes, I meant EXP 1/2 to maen taking the square root of V/B.) In order for Francis and Vavrus to claim otherwise, they need to show where this realtionship is wrong, or where it was improperly derived. They have done neither. Ma Rodgers, your response is a bit more reasonable but none the less, there seems to be an attitude that older work is irrelevant if today’s Phd’s ignore it. That is preposterous. If Francis or Varus can show where these equations in the founding literature are wrong, then they have a valid hypothesis, but not until then and the reviewers should have caught the error in assumption. Philippe, your post contains no citations that show how to compute the amplitute of Rossby waves or where the equation I gave is wrong. That is what is the key point in my writing to criticize, and as the moderator has asked of me, lets cut the dogpiling and “sloaganeering” . Your references not only fail to give a citation that disproves what I have provided, you are using references like the University of Oregon and calling them an “institution of superior education”. What does this mean when they offer no major in atmospheric science or meteorology and have no Phd’s on their staff to teach atmospheric science? Turning briefly to the hurricanes I brought up, a few points for Michael Sweet: You are correct about hemispheres being divided at the dateline or 180 degree meridian so my bad for misstating that. But I was thinking of the body of water called the Pacific ocean that provides the fuel to both eastern Pacific hurricanes and western Pacific typhoons. Would that not be a better comparative for the puposes of climate rather than assigning an arbitrary cut-off meridian that has no climate significance? To challenge some of your other points, I spoke by telephone this morning with Dr. Chris Landsea of the National Hurricane Center and asked about observing techniques that were used in the 1960’s. To start with, he does agree the older techniques are not as good as those used today but I never said older methods were better. It is interesting to note that what they did do in those days was fly recanaissance aircraft down to 500 ft off the ocean surface under cloud bases to estimate the winds and had a US Air Force Weather Officer estimate visual conditions by a developed hurricane “beaufort scale”. They also used doppler techniques as Jeff Masters mentions, but his quote from a “hurricane expert” at the time regarding the doppler technique makes no sense. The quote claims that because they were concerned about getting attenuation from flying sea spray that readings from the doppler shift would be erroneously high. The opposite would actually be true and the readings would be too low because the reference would be with respect to the true airspeed of the aircraft to get the ground speed and compute the surface winds. That is something I am quite faniliar with being an FAA licensed Airline Transport Pilot and Flight Engineer. The point in all of this is not to claim methods were better then than now, but there is no justification in claiming speeds were measured too high alone, either. There is a degree of error in any neasurement and these criticisms do not address the actual numerical significance. It would appear by these techniques they were accurate and the margin of error could be in either direction with changing circumstances. BTW, Dr. Landsea has informed me that the National Hurricane Center is writing up Hurricane Patricia and intends on putting it into its perspective in comparing it to the record. Those of you who believe hurricane intensity is getting stronger and related to “climate change” may not like what he is going to say, but it will be up on their website soon. Finally, I sense a lot of tension from the readers of this blog as well as a venomous dislike of any who take issue with the orthodoxy of what is written about humman induced climate change from CO2. There also seems to be a double standard on this site. The moderator is asking as do the bloggers to provide specific citations to back up claims made about a topic like this. There is nothing wrong with asking for them and I have provided them but I take note of the fact that the author of this article provides no citations for any of his claims other than a reference to Jennifer Francis at the end. Who is John Mason, what are his qualifications to write about meteorology or atmospheric science and why did the moderator accept the article without asking for specific citations of published work to back his assertions be included? There is also a fake credential degradation used by warmers that needs to be pointed out here. Anyone who holds a bachelors degree or higher in atmospheric science is qualified for employment as a forecast or other operations meteorologist by the US National Weather Service. That is a national standard applied by the agency. It has nothing to do with “qualifying” to be a TV weathercaster. In that arena, there are no standards and plenty of scientific illiterates who know little but use the AMS TV Seal of Approval whose standards were lowerd to less than academic to claim the use of the title “meteorologist”. Many of these people call themselves meteorologists but they absolutely do not meet the professional standards required for employment at the US Weather Service and that is the standard that counts. There are no licensing authorities that police the use of this title. The US Weather Service used to do it but ceased after standards were lowered to obtain a TV or Radio AMS seal. Hope this all helps. Francis, J. A., and S. J. Vavrus, 2012: Evidence linking Arctic amplification to extreme weather in mid-latitudes. Geophys. Res. Lett., 39, L06801, doi:10.1029/2012GL051000. Haltiner and Martin, 1957: Dynamical and Physical Meteorology. Library of Congress Card Number 57-8005, Chapter 20. Martin, 1955: Generalization of Constant Absolute Vorticity Trajectories. Research paper number 7. Platzman, 1947: Some Remarks on the Measurement of Curvature and Vorticity. Journal of Meteorology, Volume 4, pages 58-62. If we compare the physical meaning of what defines Rossby wavelength and speed in these equations, the corollary is clear. As the wind speed increases along the given waves, so must the amplitude and wavelength. As speed decreases, so must the amplitude of the waves and their respective wavelengths, with the maximum amplitude of the waves being realized when the inflectional direction has a backed wind direction to south or even east in the case of closed off low pressure streamlines. THIS IS CLEARLY IN CONTRADICTION AND OPPOSITE OF WHAT IS CLAIMED BY FV (2012). This is the peer-review that was absent from Francis and Vavrus (2012), it hardly needs peer-reviewed publication (were the reviews published? no). The paper must survive this criticism, if if can’t it has no standing whatsoever. Any rebuttal Simon? I don’t think so. Firstly, the correct term is “refereed” paper. Such a paper defers to references i.e. a list of referred papers – your term. See more on the Francis and Vavrus references below. Wiese firstly refers to 2 published meteorological texts i.e. heavyweight definitive meteorological physics references. Only secondly does he refer to 3 research papers. In references, they do NOT defer to any definitive meteorological texts relevant to the appropriate physics. Needless to say, they don’t apply meteorological physics in their paper. They just waffle. Meteorology makes no recourse to the theoretical radiative physics of the greenhouse effect to determine temperature anywhere in the atmosphere or surface e.g. nightly TV weather forecasts. Same for the space race. The US Air Force Labs modeled atmospheric temperature from surface to top of atmosphere without recourse to the greenhouse effect, first in 1963 and updated in 1976. Warmies are adamant that only the greenhouse effect can explain surface temperature, but they can’t model surface temperature with those theoretical principles for daily weather as do meteorologists. Unfortunately there are those in meteorology, like Francis and Vavrus, who being unable to usefully adopt the greenhouse effect in their discipline, twist the principles of meteorology to get on board the climate gravy train and to gain go-to prominence. Francis and Vavrus ideas have been accepted as fact by the US media (and propagated elsewhere) where they have gained plenty of traction, especially Francis. But not much support from the meteorological or climate community (except in pal review that is). In April 2014, the Competitive Enterprise Institute (CEI) sent a request for correction of this statement under the federal Information Quality Act, citing peer-reviewed scientific articles debunking it. In June 2014, OSTP rejected this request, claiming that Holdren’s statement was his “personal opinion,” not the agency’s position, and that it thus did not constitute “information” subject to the Information Quality Act, which excludes “subjective opinions” from its reach. usually waives any privilege to keep it secret. After OSTP persisted in keeping these records secret, CEI sued it in federal court in October 2014. This is one of many FOIA lawsuits against the Obama administration, which former New York Times editor Jill Abramson said is the most secretive ever. The Huffington Post says that the “White House denies more FOIA requests than ever” these days. A potential explanation for all this is that OSTP’s Polar Vortex video was originally produced and posted not as the personal opinion of the agency’s director, but as an agency project. OSTP sought, and succeeded, in getting widespread news coverage for the film. But once its inaccuracy became clear, the agency invoked the personal opinion excuse as a way of avoiding accountability, and it did its best to maintain that façade even if it meant going through time-consuming and expensive litigation. Jennifer Francis being an unbiased and objective climate scientist, who relishes other’s critique of her work /Sarc. Interesting paper by Prof Mike Kelly (Cambridge Uni….ex New Plymouth, Victoria Uni) about trends in extreme weather events since 1900. Especially interesting sentence at the end of his introduction… states that NZ’s temperature rise record is solely due to ad-hoc adjustments. His main conclusion: first half of the 20th Century had more extreme weather than the 2nd half. Compiling GHCN V2 as Euan Mearns has done is no different to NIWA’s flagship Virtual Climate System Network (VCSN), that you have to pay to subscribe to. Thanks for pointing out this paper; it’s always good to hear what Mike Kelly has to say. 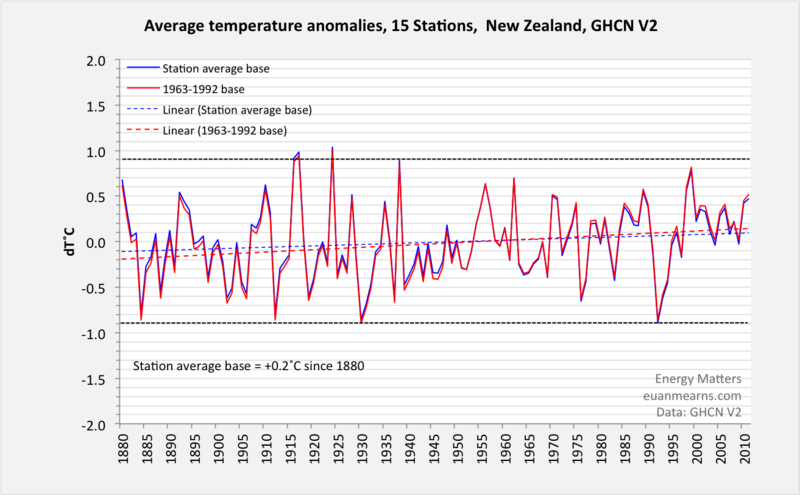 Readers will remember that the CCG and the NZ Climate Science Coalition announced in 2009 that warming over NZ was man-made — that it was created only by adjustments to the raw readings. Our paper, Are we feeling warmer yet, caused quite a stir. It was immediately tabled in the NZ parliament by Rodney Hide, in the European parliament by Godfrey Bloom, and cited around the world. The work was done by Bob Dedekind, who discovered the strange discrepancy between NIWA’s public graph and published data in the first place. He’s my hero. Written by Hans Bader, Lid Blog on 25 March 2016.